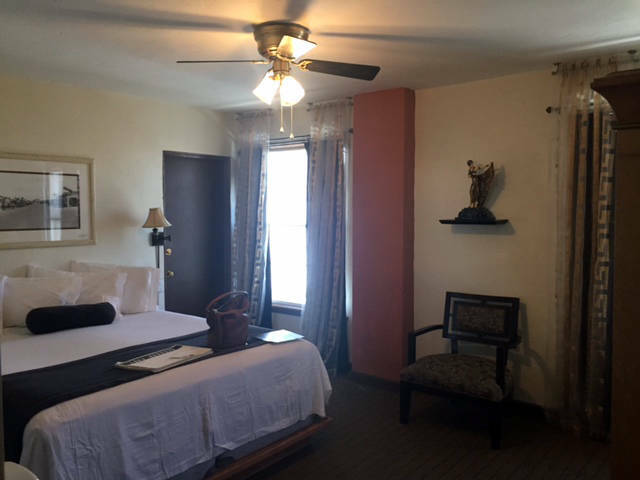 In a matter of days, six rooms at the Boulder Dam Hotel went from drab to fab as they were remodeled as part of The Great Hotel Flip room design contest. Hali Bernstein Saylor/Boulder City Review Teresa Giroux and David Baker created the winning airplane room at the Boulder Dam Hotel as part of The Great Hotel Flip room design contest. Baker, a retired airplane captain, and Howard Hughes served as Giroux's inspiration for the room, which featured a chair wrapped with an airplane wing. Hali Bernstein Saylor/Boulder City Review The winning design in The Great Hotel Flip room design contest was created by Teresa Giroux and inspired by sponsor David Baker, a retired pilot, and Howard Hughes. 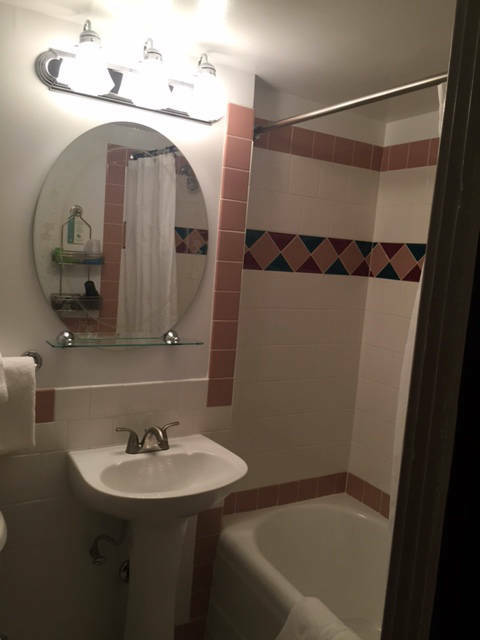 Hali Bernstein Saylor/Boulder City Review Gray subway tiles and hexagon metallic accent tiles highlight the bathroom of the winning design in The Great Hotel Flip room design contest presented by the Boulder City Museum and Historic Association. The room was designed by Teresa Giroux. 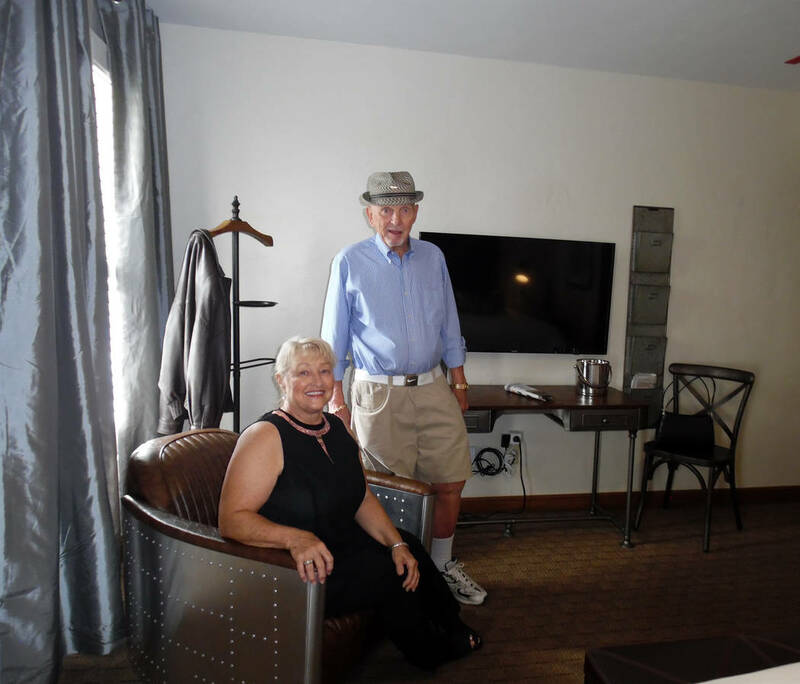 Hali Bernstein Saylor/Boulder City Review Jonathan Bollas paid tribute to Carole Lombard in the art deco-inspired room he designed at the Boulder Dam Hotel as part of its Great Hotel Flip room design contest. 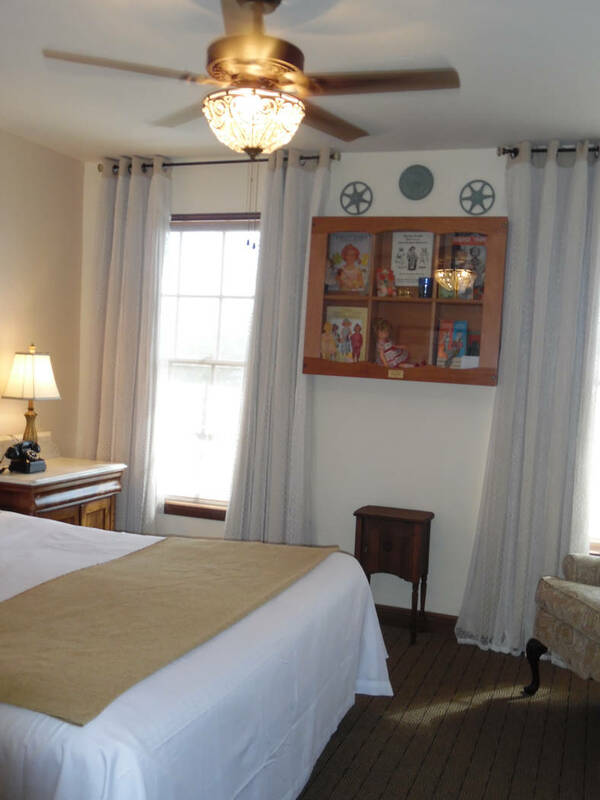 Hali Bernstein Saylor/Boulder City Review Jonathan Bollas used art deco pieces such as these lamps when designing his hotel room at the Boulder Dam Hotel as part of The Great Hotel Flip room design contest. Hali Bernstein Saylor/Boulder City Review Carole Lombard, who once stayed at the Boulder Dam Hotel with her husband, Clark Gable, inspired the art deco decor in the room designed by Jonathan Bollas as part of The Great Hotel Flip room design contest at the Boulder Dam Hotel. 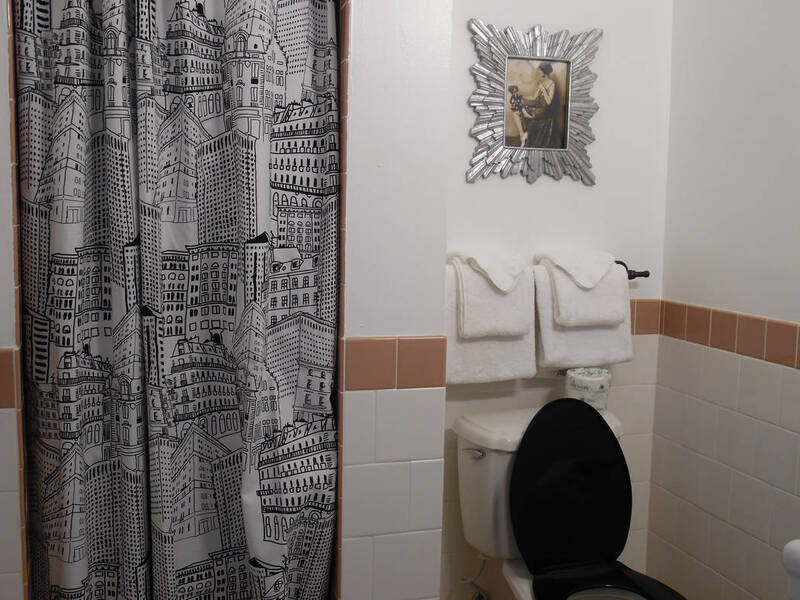 Hali Bernstein Saylor/Boulder City Review The art deco theme in the room designed by Jonathan Bollas included a black and white shower curtain and black toilet seat with gilded and mirrored glass art accents. 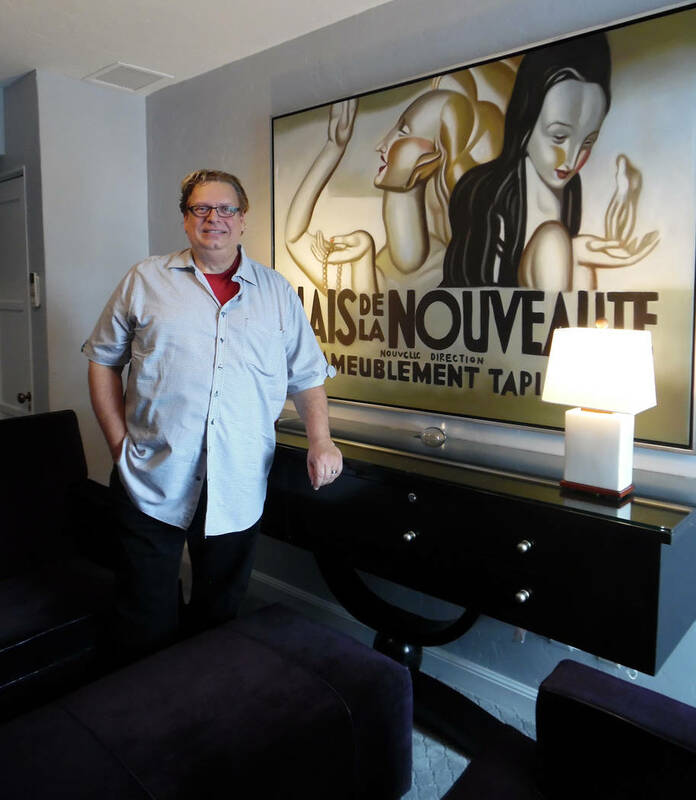 His decor for The Great Hotel Flip room design contest was inspired by Carole Lombard and the art deco period. Hali Bernstein Saylor/Boulder City Review Priscilla and Bret Runion designed and decorated the room sponsored by Desert Sun Realty in The Great Hotel Flip room design contest at the Boulder Dam Hotel. They said they wanted to provide guests with plenty of storage, modern facilities and local scenery. Hali Bernstein Saylor/Boulder City Review Alice Brumage paid tribute to Shirley Temple, who visited Boulder City, in the room she designed at the Boulder Dam Hotel as part of the Great Hotel Flip Room Design Contest. Hali Bernstein Saylor/Boulder City Review Granite countertops and an upgraded kitchen area were part of the suite designed by Bret and Priscilla Runion as part of The Great Hotel Flip room design contest at the Boulder Dam Hotel. 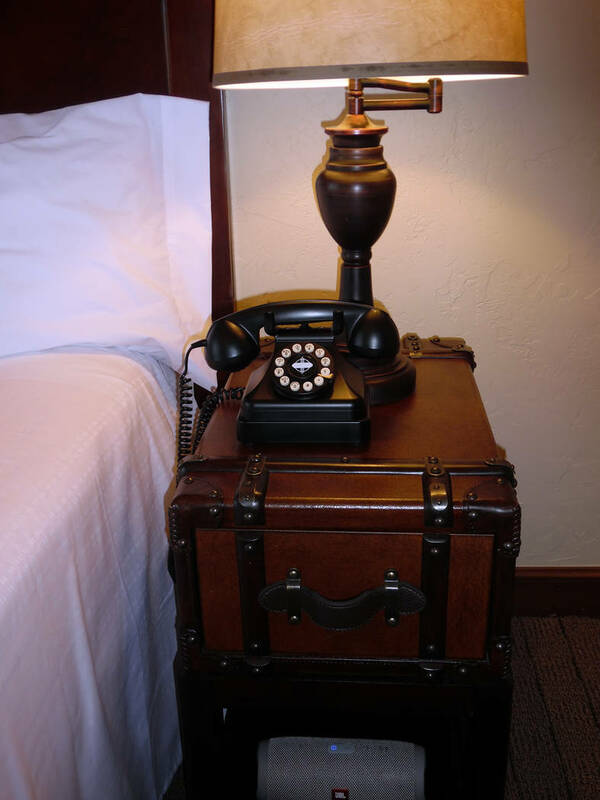 Hali Bernstein Saylor/Boulder City Review Narrow nightstands resembling suitcases added to the travel-themed room designed by Bret and Priscilla Runion in The Great Hotel Flip room design contest sponsored by the Boulder City Museum and Historic Association. Courtesy This is what the winning room at the Boulder Dam Hotel looked like before The Great Hotel Flip room design contest. Courtesy The bathroom of the winning design in the Boulder City Museum and Historic Association's The Great Hotel Flip was dated. 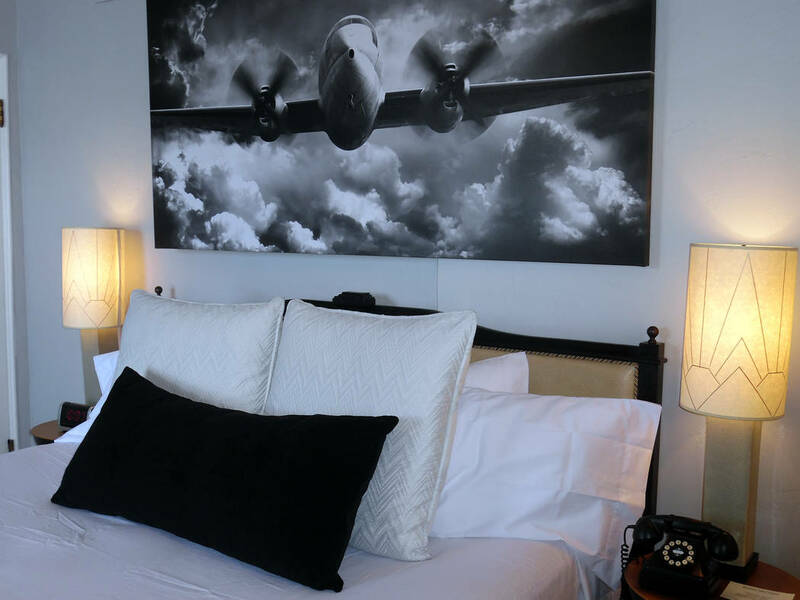 The airplane room, a tribute to Howard Hughes and sponsor David Baker, a retired airline pilot, that was designed by Teresa Giroux won the contest. 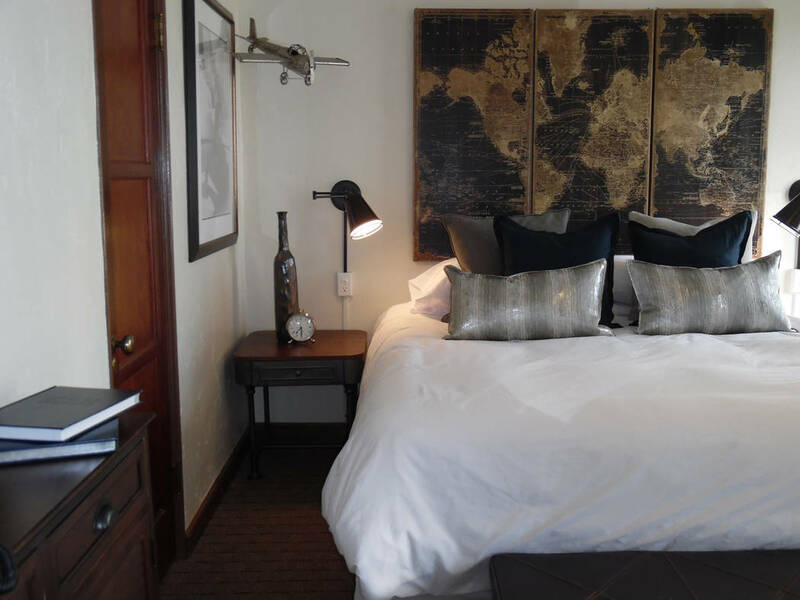 Done in shades of brown, gray and silver with a pop of color provided by a painting of a male peacock, the room included a low, brown leather chair with an airplane wing wrapped around the exterior, a small model airplane hanging in a corner, a large map of the world serving as the headboard, a brown leather bench at the foot of the bed, silver drapery over white plantation shutters, a desk, coat tree and small suitcase accents. The bathroom continued the gray and silver color scheme with gray subway tiles on the shower surround with a metallic silver tile inset. 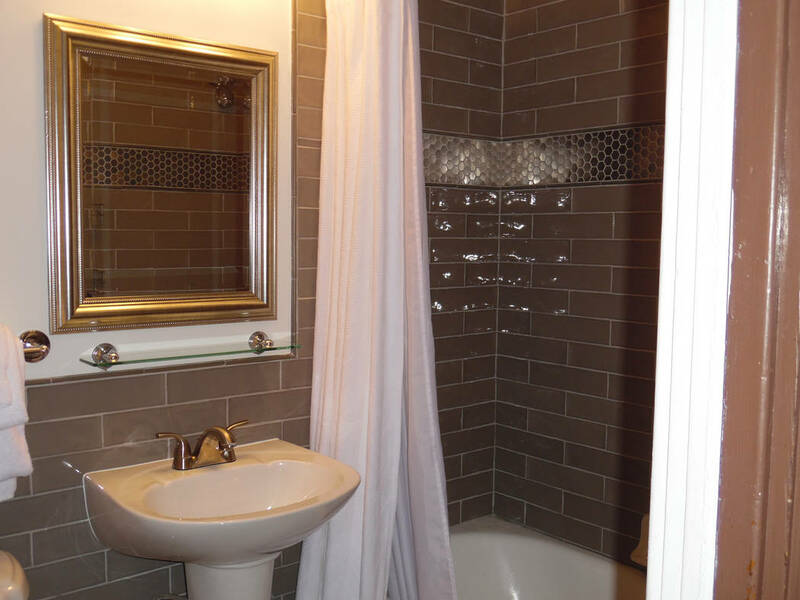 Giroux said the bathroom tile was her most extravagant expense but felt it was important and made a great statement to complete the room’s look, which has a calming and peaceful feel. Giroux also was happy to learn that the ceiling fan she selected was actually a Delta model and paid tribute to the airline for which Baker flew. She said the room felt masculine and feminine at the same time, had great function and was exactly what she would look for if she was a guest at the hotel. Fellow judge and designer Lisa Teepen of Lifestyle Interiors agreed. Diane Brumberg, who recently retired from Interiors by Diane, helped judge the contest presented by the Boulder City Museum and Historic Association. Jonathan Bollas’ art deco-inspired tribute to Carole Lombard, sponsored by Bruce and Rose Woodbury, won the people’s choice vote. Bollas changed everything in the room, including the carpet, tile, countertops and paint. 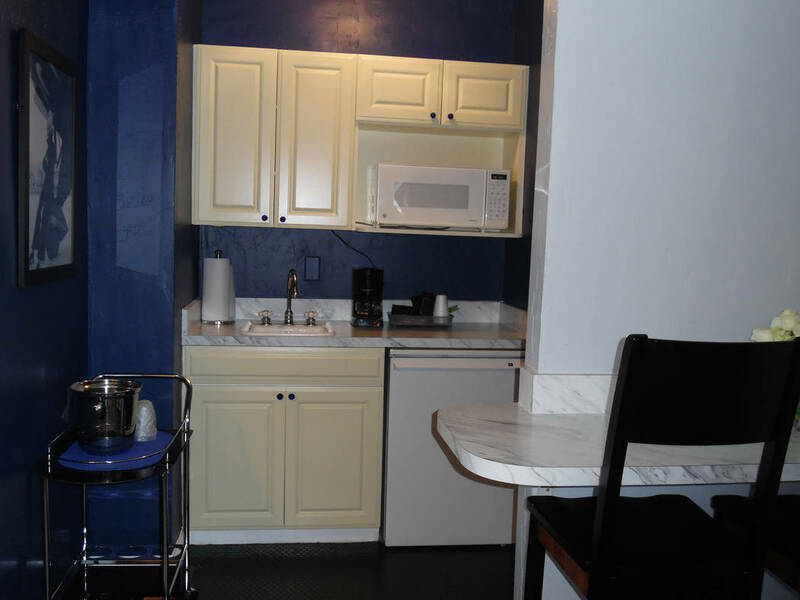 The room was painted a gray-lavender, with the kitchen area a deep blue-purple. The plush seating in the living room area was royal purple, and the furnishings were a mix of antiques from the art deco period and replicas. 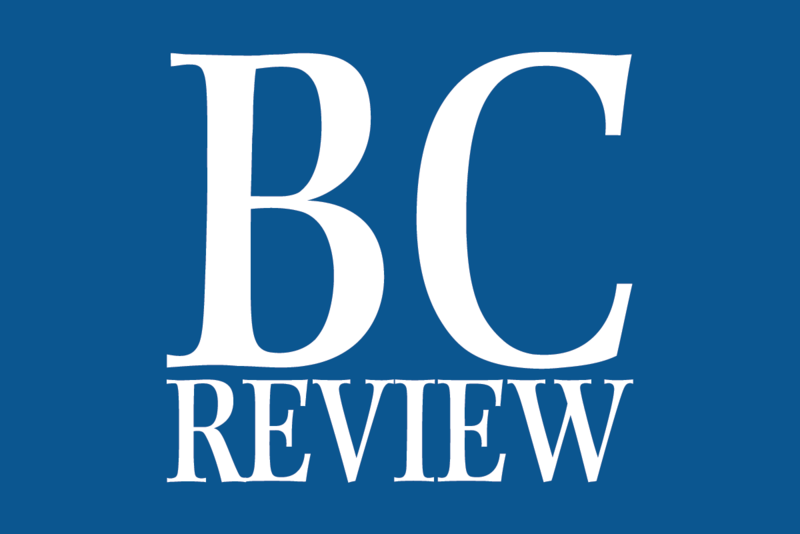 The designer and antique dealer who works at Bella Marketplace said his biggest challenge was the bathroom, which had cracked walls that needed to be replastered. Before Bollas started working on the room, it was done in yellows and browns and everything had a “smoked” feel, he said. In addition to providing much-needed makeovers for the rooms, the contest served as a fundraiser as the entrants were required to invest as much as $3,000, which was matched by the museum association, to give each designer a maximum of $6,000 to spend. Each designer had just four days to complete the work. “It was so wonderful to be able to do a design project with people who were not affiliated with the hotel before,” Giroux said. 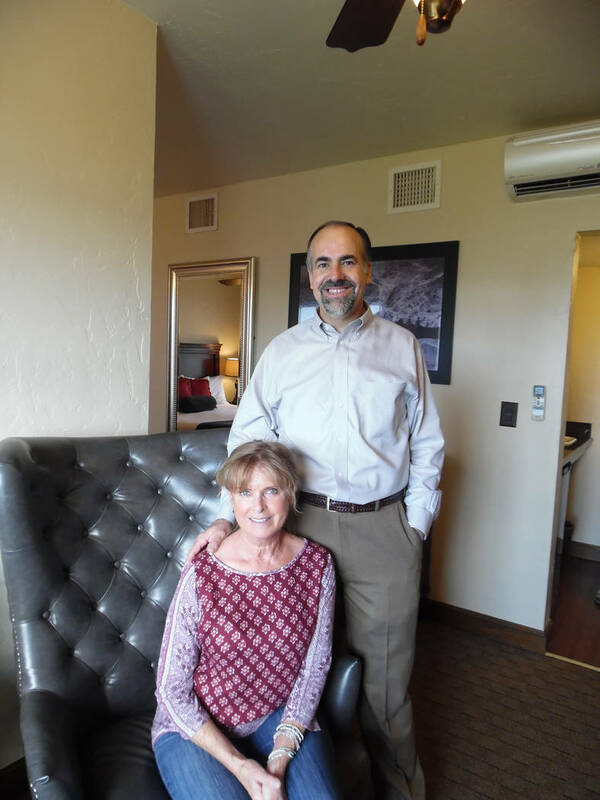 Priscilla and Bret Runion, who designed room 224, which is handicapped-accessible and was sponsored by Desert Sun Realty, said they put in all the features they look for when traveling, especially storage, USB ports for electronic devices and a full-length mirror. 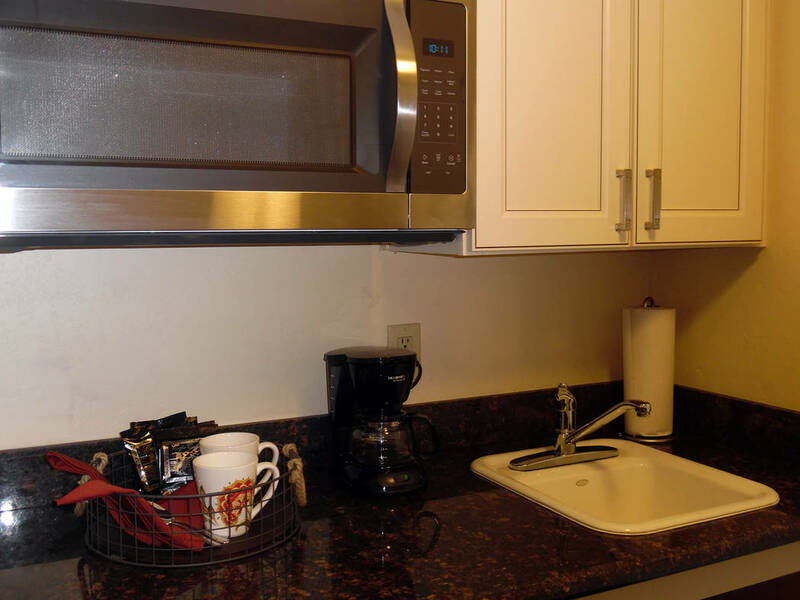 They also focused on the room’s kitchenette, installing granite countertops and upgraded cabinetry and hardware to make the room as beautiful as it is functional. “More than anything else, this was lots of fun,” they said, adding that those visiting the hotel rooms were expressing interest in the next contest. Giroux said she was thrilled that the contest brought in so many people who had never been in the hotel. Woodbury said the contest was definitely a labor of love for those involved and said they all put in a great amount of work and effort. “The best thing was to have people feel they are a part of the museum and hotel,” she said. Additional designers and sponsors were: room 203, designed by Giroux, sponsored by Boulder Dam Credit Union; room 209, designed by Alice Brumage, sponsored by Brumage and friends; room 230, designed by Bridgette O’Neil of Bloom, sponsored by Jim and Karen Holland, Shawn and Cynthia Fleming and Bridget and Tim O’Neill.